Sorry for the slacking. I've been cooking here and there, but mostly stuff that is either on here already or stuff I am not ready to put here because it is new or not what I think is special enough. Yeah. I am a food snob. At least when it comes to this. So when I made these cookies I thought they would be a great recipe to post here. Because chocolate on top of chocolate is always special! I made a double batch of these and took them to work. It is my own little effort at morale boosting. Put 60% cacao in a microwave safe bowl with the butter. Melt on medium heat for 30 seconds. Continue melting about 20 seconds at a time until chocolate is just melted but NOT bubbling hot. In a separate bowl, beat together eggs and sugar until well-blended. 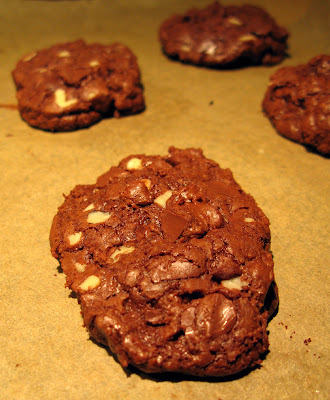 In a small bowl, mix flour and baking powder, then stir into chocolate mixture. Mix chips and nuts in gently until blended. Place half of the dough on a large piece of plastic wrap and form a log about 2 inches in diameter and 8 inches long. The dough will be pretty soft, almost like batter. Use the plastic to form the dough. Repeat this with another piece of plastic wrap and the rest of the dough. Chill dough in fridge for at least an hour. Unwrap dough and cut into slices about 3/4 inch thick. Put dough on parchment lined or greased baking sheet about 1 inch apart. 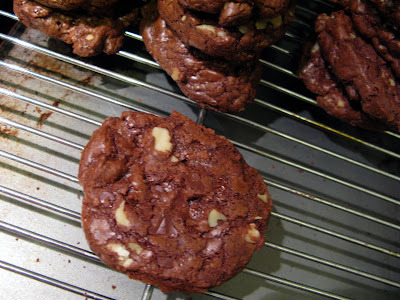 Bake 12-13 minutes or until cookies have a shiny crust on top. The interior will still be soft. 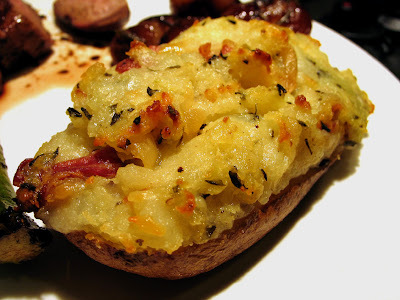 I love twice-baked potatoes. For me they are one of the ultimate comfort foods. 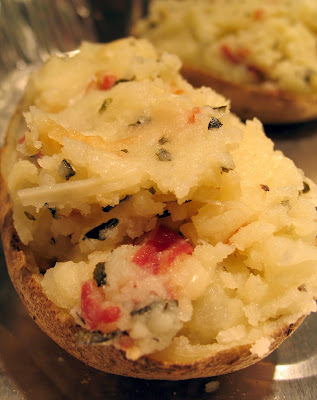 If I am baking potatoes for another meal, I might throw in a couple extra to have for twice-baked. And you can pretty much add anything you want to them as far as the cheese and herbs and add-ons go. This time around I had some pancetta in the fridge, so I decided to give that a try in there with the other goodies. 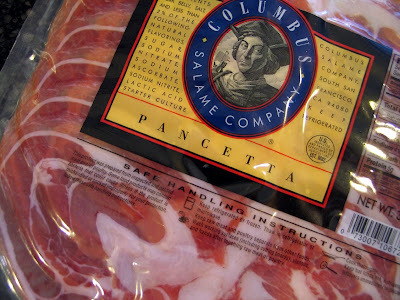 I like pancetta, which is an Italian type of bacon. I make extras of these and don't bake them. I freeze them in pairs to bake later. They make great freezer food! And they are easy enough to make more vegetarian friendly. Just skip the pancetta. 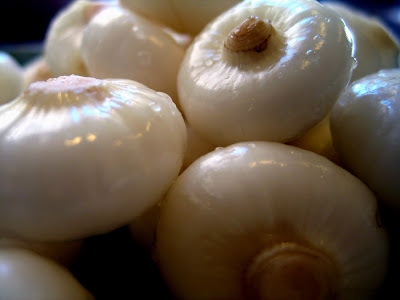 This is the garlic, before cooking. After cooking it will be golden brown. I like to use roasted garlic in a lot of things. It is great in pasta dishes and potato dishes. It's also great on the side with baked brie and bread. Or just with the bread. Once at an Italian restaurant in San Francisco's North Beach, they put out a little bowl of what they called "Italian candy." 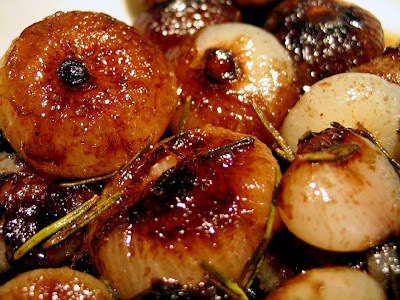 It was just plump cloves of garlic roasted in olive oil. Roasting garlic turns the sharp taste into a mild, nutty flavor. This is quite a simple method. Peel the garlic cloves, but leave them whole. 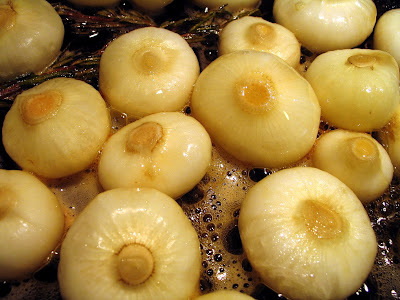 Put garlic cloves in a small, oven safe dish. I like to use glass or ceramic. I worry metal might react with the garlic and change the flavor. Who knows? I just play it safe. Pour just enough olive oil over garlic to cover it about half way. Season lightly with sea salt. Place dish of garlic in oven and cook for 30 minutes. Stir and cook for no more than 30 minutes more, keeping an eye on it. You want the garlic to get soft and a little bit golden brown. You don't want it to get too dark and brown. If you cook it too long, it turns from nutty to bitter. If it looks done before the full hour is up, take it out. 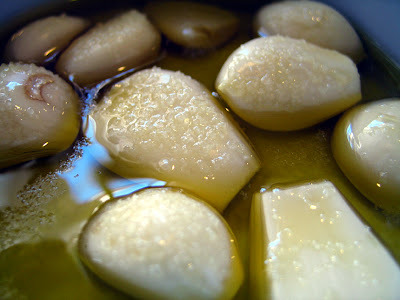 Remove garlic from oil, setting oil aside. The garlic can now be used in any number of ways. 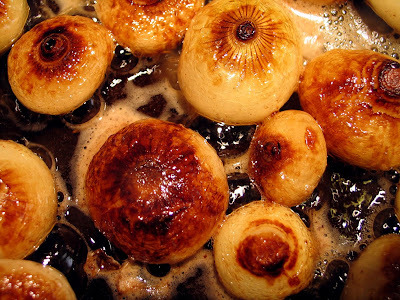 Oh, and the oil is now infused with roasted garlic. It's great as a bread dipper. When I make something like a simple grilled steak, sometimes I like to make a little something that at least looks fancy to garnish it. Stuff like this goes well with most meats, roasted or grilled. Sometimes I make mushrooms sauteed with wine and garlic. 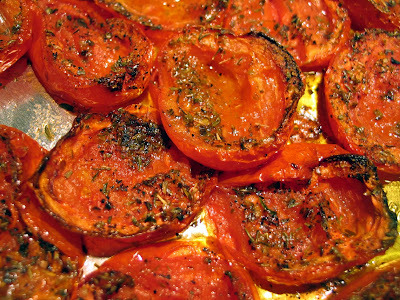 Sometimes I make the easy roasted roma tomatoes. They both have good, bold flavors to stand up to the meat. Another thing that works well? I usually buy the whole onions with the peels on. 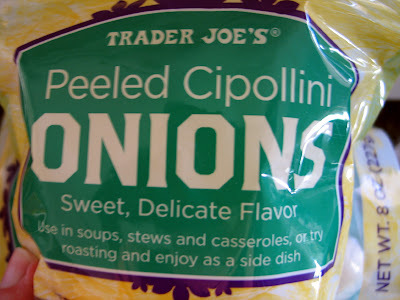 But Trader Joe's (oh how I love that place) recently started selling them already peeled. I just opened the bag, washed them and sorted them to make sure there were no duds. I found only two in the whole bag that were mushy, so I tossed them. When I make a steak that looks this pretty - restaurant pretty - the manfriend says I am just showing off. So why not really show it off? This was from last weekend. I know grilling purists will not like to hear this, but it was cooked on a gas grill. I use a grill pan similar to this over the regular grill rack. It is a large cast-iron sort of pan with raised ridges. These ridges are what make the lovely, lovely marks. I get that thing as hot as possible then put the steaks on. 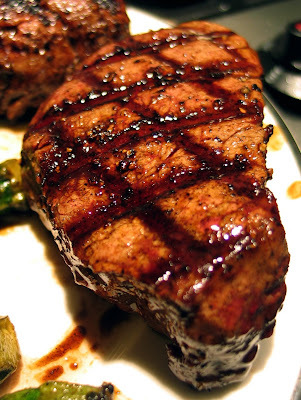 The steaks are seasoned simply with salt and pepper and rubbed with a little olive oil. The key for the grill marks is to let the steaks really cook in one place for few minutes, then without flipping them over, turn them a quarter turn. Let them cook another couple minutes and you get the crisscross pattern. Then flip them to cook the other side. Now me, if I get the pretty, pretty grill marks on the first side, I don't even bother with the other side. I just let the steak finish cooking. Because making it perfect on both sides would really be showing off. I am been meaning to post this for a couple of weeks now. Various things have kept me from do so. Mostly just laziness, I guess. You know, looking back on it. I like this dish because the chard is unexpected. 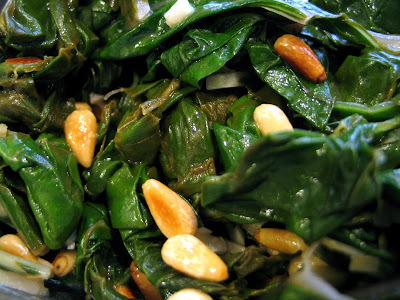 And within the chard, the pine nuts are unexpected. Plus it is pretty easy and very satisfying when you want big comfort food. First, toast the pine nuts. 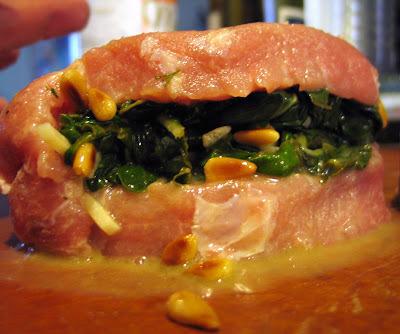 To do this, put pine nuts in a small sautee pan and heat on high. 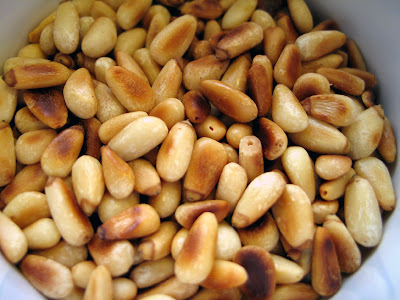 Let pine nuts start to brown, stirring frequently. These will go fast, so do not leave them unattended. They can burn quickly. You just want them to turn a rich, golden brown. Once they are done, remove them from the hot pan immediately and set aside. In a large sautee pan, heat 2 teaspoons olive oil on medium high heat and add chard and garlic. 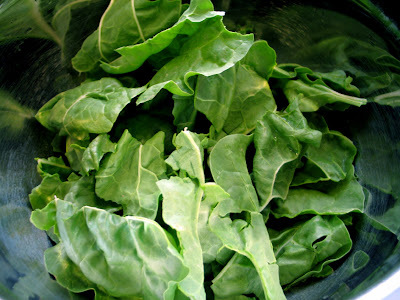 Cook, stirring frequently, until chard is wilted. Turn off heat and stir in pine nuts. Season with salt. Set chard aside to cool a bit. 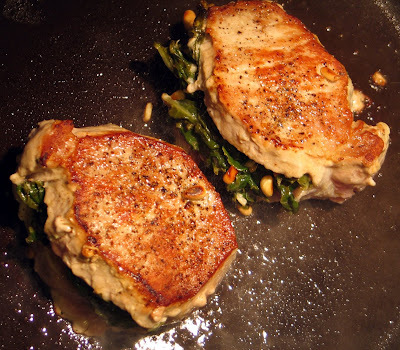 Finally, it's time to prepare the pork chops. Cut a pocket in the side of each chop. Do not cut all the way through. Fill pockets with chard, gently press closed. Secure with toothpicks. Wipe excess liquid out of pan used to cook chard. Heat 1 tablespoon olive oil over medium-high heat. Add chops to the pan and cook until browned on one side, then flip them. I removed the toothpicks at this time because my chops seemed to have set up enough at this point. Once they are browned on both sides, add broth and wine to the pan. Heat liquid to boiling then reduce heat and cook, covered, for about an hour at low heat. When chops are done, remove from pan. To make sauce, heat liquid on high heat and boil until liquid reduces to about 3/4 to 1 cup. To serve, remove tooth picks if you did not do this in the browning stage, plate chops and pour sauce over them. Sorry, my pictures of the finished product were not good. So you get a shot from the browning process, just before I added the broth and wine to simmer them. I served these with the roasted tomatoes and mushroom-sage bread pudding. I was at the grocery store recently and saw a magazine with these beautiful little potato cakes on the cover. I decided, without even buying the magazine, that I could attempt something similar. I have made the big, skillet size potato pancake before. This would just be on a smaller scale. And a little fancier as an appetizer. Wash potatoes. Depending on the type you are using and your taste, you may want to peel them, too. Since I used the tiny potatoes with the thin skins, I just washed them. Using a cheese grater or a food processor (this was a big time saver! ), shred potatoes. As you work, transfer potato shreds to a large bowl of cold water. Let potatoes rest in the cold water for 15-20 minutes to reduce the amount of starch in them. Drain potatoes and rinse with cold running water and dry using a clean kitchen towel or paper towels. Dry the large bowl used to soak potatoes and put the dried potato shreds back in it. In a medium bowl whisk together eggs, dill, bread crumbs, salt and pepper. Add egg mixture to potatoes and stir to mix well. Heat a large frying pan with 3/4 inch of oil in it over medium-high heat. Once the oil is hot, use a large spoon or your hands (I used my hands, they are the best kitchen tool!) to scoop out a ball of the potato mixture about the size of a golf ball. You want kind of a loose lump of potato. Don't compress it too much or you will squeeze out all the egg, which is what holds it together. Flatten the potato ball slightly and use a spatula to slide it into the hot oil. Press down a little more to make the potato patty. Do not crowd your pan. I cooked these four at a time. Cook until edges are brown and crispy, about 2 or 3 minutes, then carefully flip them over. Cook on other side about 2 or 3 more minutes until that side is also golden and crispy. I like these at room temperature, but they are sure good hot, too. They also are good plain, but for me even better with a few tasty treats on top. This time around I went fancy. First, I made the wasabi sour cream. Which basically means taking a couple spoons of sour cream and mixing in some wasabi until I get the flavor and heat I like. I drizzled a little of the cream on each potato cake, sprinkled on a bit of shallots, added a piece of the smoked salmon then some capers. We had two each as an appetizer. The rest went in the fridge for leftovers. Manfriend was not a fan of the capers. He said they were quite strong. Which is why I liked them. 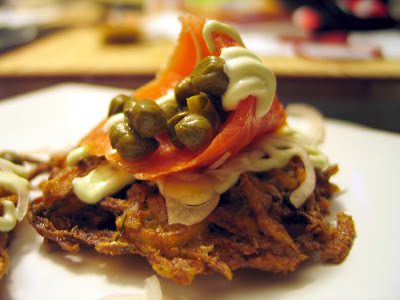 We had leftovers of these the next night and I reheated the cakes in a little oil and skipped the capers on MF's portion. hard to clean, sticky mess. So this is easier. I know some people are not fans of tomatoes. I will eat them like apples. I like them sliced with cottage cheese. I put them in sauces, in salads, on sandwiches and in stews. And if I see an unripe, green tomato at the market, which is a rare thing, I buy it to make fried green tomatoes. But one of my favorite ways to prepare them is to roast them. It's very easy and the result is soft, yummy tomatoes with a super concentrated flavor. So, if you are not a tomato fan, this is not for you. But if you like tomatoes as much as I do, give this a try. 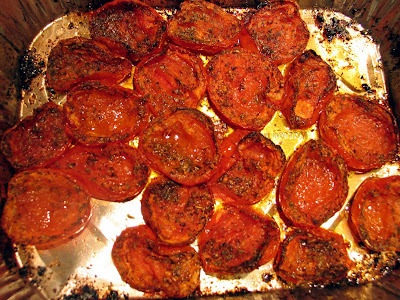 I eat these roasted tomatoes as a snack, as a garnish for roasted meats, on burgers, on sandwiches, on salads, with bread and a good sharp cheese as an appetizer, tossed in pasta... really, I just eat them. I made some Monday to go with dinner and they were gone in a flash. So tonight I made some more. I like to use a grapefruit spoon to scoop out the seeds. and need to scoop that fuzzy stuff out to get to the heart. and seasoned with pepper, sea salt and dried oregano. 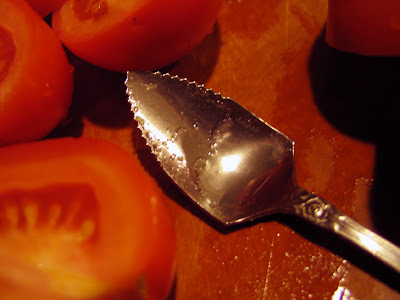 Cut the tomatoes in half and scoop out and discard the seeds and juice. 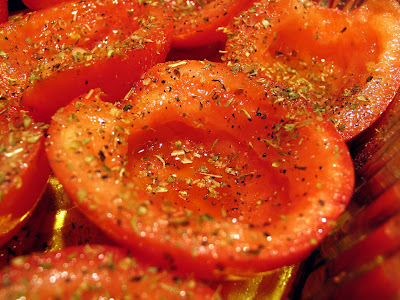 Coat tomatoes with olive oil. Roast at 425 degrees for an hour or until as roasty-toasty as you like them. I like mine when they are just starting to get crisp around the edges but are still soft and juicy in the middle. They are good hot or at room temperature. Tonight I just ate a few of them straight out of the oven as a snack. I will put the leftovers in the fridge to add to a salad for dinner tomorrow.